I recently attended a Clown in the Classroom workshop led by Mark Labrow. Despite initial reservations, we all had an absolute blast. 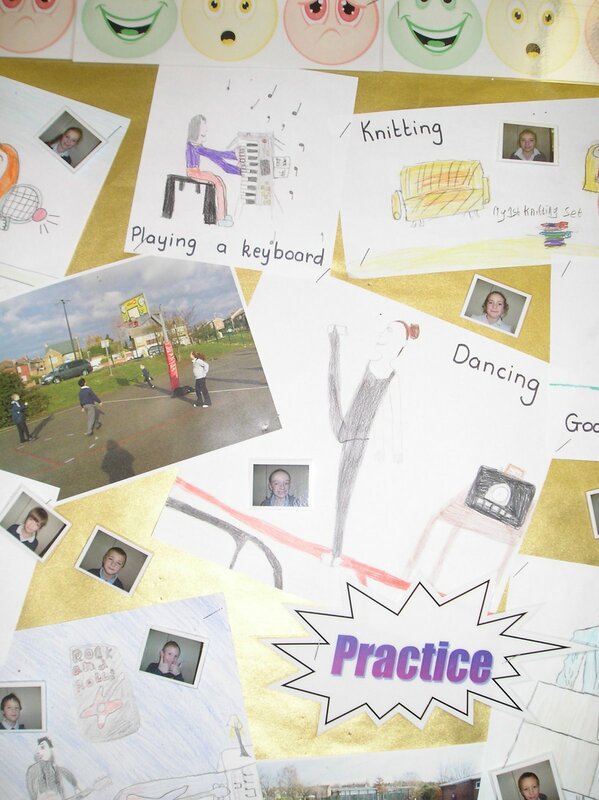 And not only that, it gave us some wonderful ideas for enhancing creativity and spontaneity in learning. None of us were required to put on big feet or big baggy trousers; a simple red nose was enough to signal we were clowns. We learnt the key is to react to everything around you as if it is the first time you’ve ever seen such a thing; in a way, to become more child-like. So, picking up a mug as if it’s just a work of genius, or sitting on a chair as if it were the most wonderful, beautiful and imaginative thing you’ve ever come across is the way to go. And of course this attitude is infectious, causing the audience, particularly if they are children or child-like themselves, to be filled with a similar sense of awe and wonder. And to wet themselves! So go on, have a go! 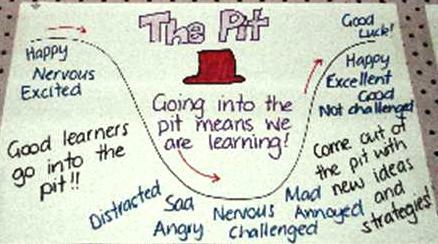 The learning pit always begins with an important concept, since it is through conceptual analysis that students gain an understanding of their world. Example concepts include: art, bullying, culture, democracy, existence, growth, indentity, justice, knowledge, language, music, number, originality, poetry, questions, reality tv, science, tourism, and so on. In July 2008, Professor John Hattie began an address on behalf of his Visible Learning Laboratory in Auckland with: “The major message from my work with 240m students, 800+ meta-analyses, 50,000+ studies is… Challenge Challenge Challenge Challenge Challenge”. Stage two of the learning pit is concerned with just that: challenging students to think more deeply, purposefully, critically and creatively. This is the point at which students co-construct an undersanding of the key concepts through continued dialogue and study with each other. According to many notable educational theorists such as Lev Vygotsky, Jean Piaget and John Dewey, there is no such thing as knowledge “out there” independent of the knower, but only knowledge we construct for ourselves as we learn. Stage three recognises this by creating the conditions necessary for meaningful dialogue. If you reflect on anything you have learned, you soon realise that it is the product of repeated exposure and thought. Thus, stage four is concerned with students revisiting and reflecting upon their learning journey. 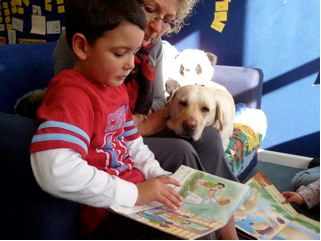 Another great aspect of Douglas Park School is their dog, Billie, a 5-year-old Golden Labrador. Owned by Annie, the school manager, Billie hangs out in the entrance hall welcoming all visitors and enhancing the family feel of the place. Doing what dogs do best, Billie offers a sense of security for children, particularly those with emotional or social difficulties; she brings a sense of fun to heated debates (she is tactically deployed to defuse any tense situation involving an irate parent or a pompous inspector); and she is the favourite attraction for pre-schoolers who look forward to patting her whilst Mum or Dad drops off their older siblings (I bet this “sales pitch” is one of the many reasons why Douglas Park recruits more and more children every year). Now though, Billie is training to be a Reading Dog. Basing herself in the new entrants room (for 5-year-olds), Billie sits attentively, listening to a child reading or watching whilst they show their latest piece of writing. Being a wholly appreciative listener, the children really enjoy having a captive audience all for themselves! This is the first of two postings inspired by a couple of wonderful days I’ve had working with the staff and students at Douglas Park Primary School in Masterton, New Zealand. Once per term, every child at Douglas Park is encouraged to invite their parents into school for a Learning Conference, during which he or she explains what they’ve been learning, how much progress they’ve made and where they intent to go next. (See Learning Conference guide). 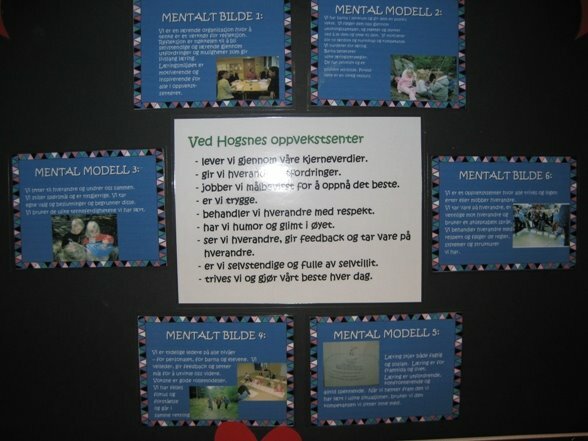 Second of all, as they explain: “Assess comes from Latin, to sit beside, so our learning conferences give parents the perfect opportunity to “sit beside” their child; to encourage our students to take personal responsibility for their learning; to develop their communication and organisational skills; to clarify for themselves and their parents their sense of progress and to further enhance the school-home communication and relationships. For more information about this, take a look at the Learning Conference Guide on the Sustained Success website or email the school. Two of the schools I’m working with, one in Doncaster (UK) and the other in Cambewarra (Australia), are trying a new approach to their curriculum that places an emphasis on Attitudes and Skills, as well as Knowledge (ASK). 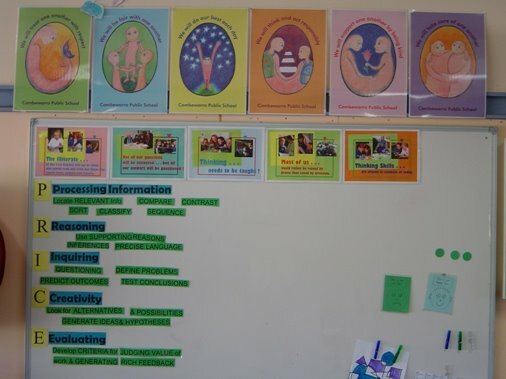 In a previous blog, (see Teaching Attitudes on 18 March 2009) I shared the Attitudes work of Sandringham Primary School. Now, here’s an insight into the Skills work that Cambewarra Primary School are doing. Selecting five key thinking skills, Processing information, Reasoning, Inquiry, Creativity and Evaluation, Trent Burns and his colleagues are ensuring that at least one of these skills is at the heart of each lesson. For example, when studying the environmental impact of technologies, the children would be asked to “paraphrase” the contributions of another, and then to add a “reason” to that opinion or argument. Of course, since the children would have to use their thinking skills in order to answer a question or complete a task, some might say the deliberate focus on a particular type of thinking is unnecessary. And yet to improve any skill, expert practice concerns itself with breaking the skill down into parts. For example, in addition to swimming from one side of the pool to the other, a swimmer wishing to improve his/her skills would be well advised to at times focus almost exclusively on head position, then perhaps on the timing of his/her arm strokes and maybe another time on the frequency of kicks. And so it is with thinking – breaking the whole skill down into parts so that the whole might be improved bit by bit. Furthermore, Trent’s students enjoy the added dimension that a focus on thinking skills brings to their lessons, referring frequently to the PRICE model either by identifying the skill they believe they are using to solve a task, or setting out to improve a particular skill by finding opportunities to practise it. Look out for an update on their progress after my visit there in June. During my time as Director of the award-winning RAIS project, I worked with a number of schools to investigate the impact of children’s attitudes on their ability to make progress. Not surprisingly, we were left in no doubt that students with the best attitude towards learning (focus, determination, effort and so on) were making significantly more progress than other students who were either complacent, uninterested or simply not engaged, even if the latter students had better grades initially. This led to the development of the ASK model, a framework that allowed for the teaching of Attitudes, Skills and Knowledge as part of the curriculum. Having shared the ASK model with staff at Sandringham Primary School in Doncaster during their work with the Community Designed Education network, I am delighted to hear that they have really gone to town with the teaching of attitudes. What I really like about this approach is that Sandringham are not following, for example Habits of Mind or Building Learning Power, but are creating their own structures based on what their children think. Each class has brainstormed the attitudes they think are necessary for learning, then taken a vote to identify the top 4 or 5. From these they are designing ways to develop each attitude through a process of teaching, investigation and practice. Their sense of purpose and of ownership is inspiring. Congratulations to everyone concerned.